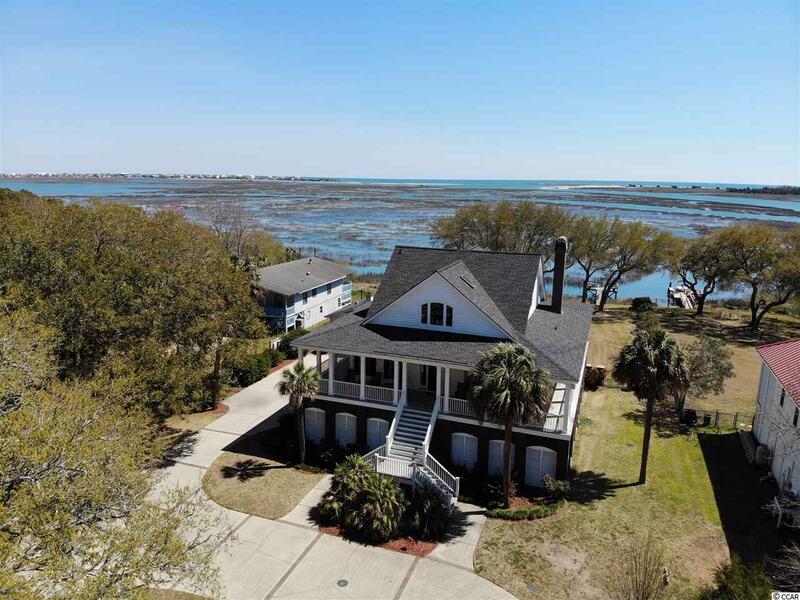 Wow what a rare opportunity to own approximately one acre of waterfront property in the heart of historic fishing village Murrells Inlet, SC! This extraordinary property has much to offer. Timeless appeal holds true in this plantation style home with guest house. Priceless live oaks invite you in to this fascinating property! A well thought out design offers wall to wall windows and doors that are surrounded by southern porches or decks! From the moment you enter your eyes are drawn to the unrivaled breathtaking views of the inlet, channel and ocean! Beautiful hardwood flooring leads the way to the light filled kitchen, dining, and living space. This open concept is perfect for entertaining! The kitchen offers white cabinets, granite counters, Sub-Zero refrigerator, double ovens, wine cooler, ice maker and cook top. The living area has an amazing brick fireplace made from the brick of the old home that was previously built on the property! The Carolina Room is spacious and flows seamlessly from the living area. Two guest bedrooms have hardwood floors, private baths and plantation shutters. Both have doorways leading to the wrap around porch! The private master retreat is a gracious size and offers a wet bar, wine cooler, walk-in closet, en suite bath and a private balcony with a captivating view! The master bath has double sinks, jetted tub and frameless glass shower! Just across the hall is an addition bonus space with two large closets. There are endless possible uses for this space, such as an office, workout room or TV room. It also could easily be made into an additional bedroom and bath! The elevator accesses all levels. Underneath this amazing home is parking, a heated and cooled enclosed work area, half bath, and tons of enclosed storage area. When you add the gorgeous pool, private dock and a guest house, you have your own piece of paradise! The spacious guest house offers a one bedroom, full bath, eat-in kitchen and a private deck overlooking the pool and inlet! What more could you ask for? Directions: Take Hwy 17 Business In Murrells Inlet. House Is On The East Of Highway 17. Selling Office: King Fish Properties, Inc.